Michael Pershan asks some good questions about how to approach the teaching of complex numbers. OpenMathBook, a blog "to promote, discuss, and develop free and open source mathematics textbooks". Maria is conducting calculus math circles with 7 to 11 year olds. I am fascinated. My understanding of calculus is so steeped in algebraic thinking, it was hard for me to imagine at first. I love what she's doing. Guest Post: John Spencer Addresses "Frustrated Parent"
There are many things I hate about the Common Core standards. I hate the way teachers were pushed out of the creation and adoption phase and how we have little voice in the implementation. I hate the fact that the standards will continue to be assessed with standardized, multiple choice tests and that these scores will be used with Value Added Measures in both teacher salary and teacher evaluation. However, I think it's important that in our criticism of bad policy we are careful to avoid blasting good pedagogy. I'm seeing many of these posts making their rounds on Facebook. I'm seeing statements like, "What the hell is a number line and why do kids need it?" Or, "just teach them the basics." The notion of using a manipulative, playing with numbers, breaking them them apart and comparing processes is somehow viewed as non-mathematical. The truth is that number lines are powerful tools for understanding integers. True, when subtraction is something simple that requires no "borrowing" it feels like a joke. However, the goal is to build up number sense. It's to help them understand math conceptually. If you flip the numbers and end with a negative number as an answer, suddenly a number line helps make the negative-positive relationship more powerful. 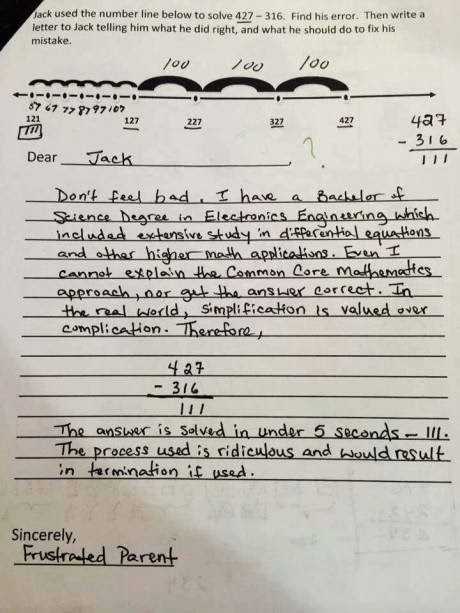 This parent's snarky answer about "the process used would get you terminated" is based on a faulty assumption that a first grader needs the same approach as an engineer. And yet . . . this "new math" approach that people mock is something we use constantly in real-world, mental math. Consider it this way: You have fifty-three dollars and you need to give someone twenty-seven dollars. What are you going to do to figure it out? If you find yourself breaking by tens and going backward, chances are you are using a mental number line. Oh, you could pull out a piece of paper and do that math that way, but chances is are that as an engineer, you'd be fired . . . or at least laughed at. I remember someone posting an angry rant about doing multiplication by breaking it up into different pieces. "Just teach the algorithm!" the parent posted. I posted a response. "If the bill is 27.42 and you want to leave a twenty percent tip, what's the answer? How did you find it?" Some people divided by five. Others multiplied by .2. Still others moved one decimal over and doubled it. Some rounded up to thirty. In other words, there were multiple processes that worked and each of them involved understanding the properties of numbers. In other words, most people used a process mentally that they were openly mocking on Facebook. Oddly enough, many of these same people who are mocking "new math" in their posts are also lamenting the fact that Singapore is kicking our butts in math. What they fail to realize is that the places where math is working are the places where they are building number sense. I've seen what happens when students lack number sense. They learn a lockstep process and think that math is the same as baking a cake. They follow the recipe without understanding why they are doing what they are doing. However, when they get into something as simple as linear equations, they struggle to know what to "do first," when there are often two or three options. When students lack number sense and they get the wrong answer, they fail to understand why an answer is illogical. You end up with a student who misplaces a decimal number and never finds his or her mistake. Asking students to think conceptually and engage in diagnostic problem-solving isn't superfluous. It's actually part of "the basics." I know that the "new" math looks different, but instead of criticizing it for being hard or being complicated, try thinking about the theories behind it. There's a reason we're using manipulatives, breaking things apart, using number lines and comparing processes. This is how math works. I got my master's degree at Eastern Michigan University. It makes me happy to see them on the web. Colorful related rates problems, and colorful descriptions of solution strategies. Turning multiplication table practice into a scrabble-like game sounds like a good idea to me. Teaching metacognition in math class. Fawn is teaching absolute value. (And giving us some great ideas.) And James Cleveland has a great inspiration, using estimation180 to help teach absolute value and analysis of errors. Math Munch collects other games like 2048. Mr.Honner once again finds a weird graph on a standardized test. It purports to be exponential, but it's not. Justin Lanier did a math circle on Celtic knots. Interesting puzzle - place the houses on the number line. I know there's some math here, but I haven't figured it out yet. Optimization, a calculus problem solved by dogs, ants, and light. Henri Picciotto has a nice visual Pythagorean Theorem proof. Looking for pictures of water coming out of a hose in a parabolic arc, I stumbled across this post about using geogebra to come up with an algebraic function that describes the path of the water. I have not yet ever taught Calc III. I'm thinking about working through this linear algebra based course, which pointed me to this video on higher dimensional spaces. The newest addictive game, 2048. Another cool looking site from NCTM, with a wide variety of math challenges. Cheesemonkey describes what gave her the courage to persist when learning involved lots of failures. How to inscribe a semicircle in a square, using geogebra. Gas Station Without Pumps thinks about what keeps women out of engineering. Some nice sine and cosine animations. 3D printing for hyperbolic honeycombs. How would you design a game, using only a fair coin, that you have a 1/3 chance of winning? No answers at the link, only thoughts about the value of hard questions. Nice challenge problems with exponents. Can you solve it without logarithms? More from This Old Train... on the roller coaster project. And a new project called Parametric Playground. Yesterday I was introducing the number e, and telling the students that my preferred definition of e is "the number that makes a slope of 1 for the graph of y=ax at x=0." I also told them that this definition makes mathematicians unhappy, and wrote out the limit definition. But I like them seeing a concrete meaning for this strange number. As I made this introduction, I mentioned that, like pi, e is irrational (not a ratio of whole numbers) and transcendental (not the solution to an algebra equation using whole numbers). I showed them the proof that the square root of 2 is irrational. But it is the solution to x2=2, so it's an algebraic number, not a transcendental number. I told them that I have not yet completely understood the proof that pi is irrational. (Updated link: Brent Yorgey, one of my favorite bloggers, posted a good series explaining it at The Math Less Traveled. But I never managed to get all the way through it.) "So it's not really math for me to say pi and e are irrational, when I don't know it by a proof but only by believing what I've been told." And then I decided that since pi was in the air, and Pi Day was coming, we'd do an activity I'll be doing today with a different group. I had them all stand up around the outer edges of the room, and hold hands, arms outstretched. The extra people made a diameter along the middle of the room. While I was getting them to stretch, I pulled people out by saying "You're out." They laughed. I told them it was a good kind of out, that we were the circle makers. In case you're wondering why getting 22 around and 7 across was so special, that makes circumference / diameter = 22/7 = 3.1428, almost perfect. And before calculators made people think decimals were cooler than fractions, 22/7 was the estimate for pi. The seventh annual Math Circle Institute will be held on the Campus of Notre Dame, in South Bend, Indiana, from July 7th to 11th, 2014. Both novice and experienced Math Circle leaders are welcome. Bob and Ellen Kaplan, Amanda Serenevy, and Nathan Pflueger will demonstrate the Math Circle approach, and participants will prepare and teach their own Math Circle classes with 1st to 12th grade students who attend each afternoon. Applications can be made by e-mail to kaplan@math.harvard.edu. The institute is wonderful. If you can go, do it. You'll be so glad you did. Bob & Ellen Kaplan (founders of the Boston area math circles, and authors of Out of the Labyrinth: Setting Mathematics Free and many other intriguing math books), along with Amanda Serenevy (founder of Riverbend Community Math Center), run the fabulous week-long Math Circle Institute, held on the beautiful campus of Notre Dame. This summer is their 7th annual Institute. The first year I was amazed that I could do math all day long and never get tired of it. There's lots of freedom to explore in whatever way works best for you. Arrive: Sunday, July 6 (or as early as you can on Monday, July 7). Notre Dame is in South Bend, Indiana, 2 hours from Chicago. plot, plan, and socialize to your heart's content in between all that. I have to clear out all my open tabs! Maria Andersen announced the release of Algeboats. Glenn is thinking about how to make some smooth connections from Algebra I thought Calc (and stat). I like what he's doing. Although I'm not sure their list is any better than Avery Pickford's Mathematical Habits of Mind. In other words, it's a good list, but not the only good one. Tomorrow I start our third unit in calculus with an introduction to the chain rule. This deep into the semester, I have usually lost most of my creative energy, and don't find time to think this lesson out carefully. I'm teaching great groups of students this semester, which is helping keep my enthusiasm high. So today I'm planning my chain rule lesson. First, some functions that we cannot find the derivatives for, because there's more than the variable inside the function. Like y=sin(2x). Here we will review the language of composition. Then a graph of the function, to see if we can figure out what the derivative ought to be. I don't usually write blog posts before I teach the class. This is an interesting point in my process. Where I go next with this may depend somewhat on the students' response to the graph exercise. I know right now that I'm not sure of their response, and that their response may inspire me to move a different direction than what I'm planning right now. I'm going to work through finding the derivative without chain rule, and trying to get the derivative in a form that matches the function. I think this will be another way to experimentally figure out the chain rule. Then we'll do the proof. I found a much nicer proof here (click on the discussion link) than the one in our textbook (Anton). Except that one vital step seems to be missing. And after that, we'll do lots of practice. The textbook is probably fine for that, if I can't think up enough examples on my feet. I got up to the first algebraic example on Monday. On Tuesday, we did the three algebraic examples. They weren't enthusiastic about walking through the proof, so I asked them to look it over on the handout shown below. We finished up by practicing with lots of examples. So many good posts lately! How will I ever remember all this good stuff?! Sam, on having courage, and math as a creative endeavor. Parametric Functions, and a rational parametrization of the circle. Better polar explorations. (This would even be good in Calc II, I think. )The key is to make it into a puzzle. And here's a puzzle approach to inverse functions. Determining distance traveled from velocity, from Robert Talbert, for calc I.
Shireen has made a Where's Waldo themed worksheet to help calc students think about position, velocity, and acceleration. I can't watch video right now, my son is sleeping. I have to watch these classroom videos, with students debating in math class, and creating theorems. I don't always agree with Curmudgeon, but I'm sure glad I follow this blog. Here's a great post on requiring Algebra II. Malke's thinking about spatial reasoning. Here's a post she linked to, with a cute question. If we fold the paper like this, and hole punch it while folded, where will the holes be when we unfold? Maria Anderson likes to think about the future. She's made four predictions about technology-enhanced learning. Have you heard of Osmos? It's a physics game app. I want to buy it. Eleven really good ideas in one day?! It's too much! Maria Droujkova was interviewed in The Atlantic! Woo hoo! Go, Maria. The title? Five-Year-Olds Can Learn Calculus. In the LA Times, Edward Frenkel describes how he thinks our tired old math curriculum cheats kids. I want to know more of the backstory behind today's xkcd. Can anyone tell me more about this? Robert Talbert on self-regulated learning. I am thinking about sharing this with my calculus class. 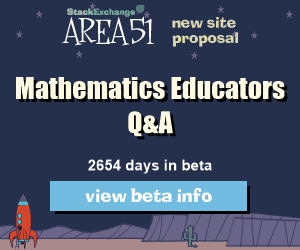 ... based on my experience of the incredible usefulness of the StackExchange sites Math StackExchange and MathOverflow, I think this site could become a great resource. Another site to follow? Oh my! But if it's a good place to get our math ed questions answered, I'm all for it. Stackexchange will only start up a new site if 200 people have committed to it. This site is 85% of the way there. (I was number 171.) If you want to help make this site a reality, click here.